Utforsk Italia utenfor fastlandet med en privat helgedagstur til øya Ischia, kjent for sine termiske bad. Møt din guide ved havnen i Sorrento og krysse Napoli-bukten med ferge. 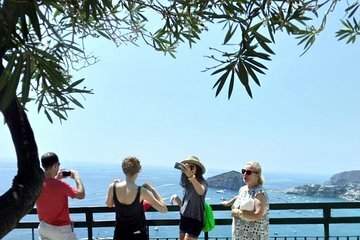 Reise gjennom Ischia med privat bil og besøk flere landsbyer, naturskjønne utsikter og strandpromenader. This tour was so worth every penny!Our tour guide, Giuseppe(native of Ischia), and our driver(?) did everything possible to ensure we accomplished our goal of seeing my father-in-law's birthplace. Aside from getting a fantastic overview of the island, with the limited information we had they went out of their way to help us locate our relative's house and, in an emotional moment, we were able to reconnect with my husband's cousin after 33 years.Even Giuseppe seemed to be visibly touched by what happened. This tour started off on the wrong foot, when our guide on the Sorrento side FAILED to warn us that there is a stop in Procida, before you arrived on Ischia. We got off early and then had to scramble to get back on a boat to take us to Ischia. This confusion, shortened our trip by at least an hour, which gave us less time to see everything on the list. Further more, the mini-van provided was not large enough to accommodate 7 of us plus the guide and driver and the AC was hit and miss. The guide was good and the place chosen for lunch was one of the highlights of the tour. All in all, Ischia needs more than one day to appreciate it. By the way, Procida might be a great destination for the day. If you wish to focus on the thermal baths or other individual features of the island, you might consider at least 2 days..